Staying ahead of the lint, dust, and grit in your home can be overwhelming. Thankfully, the right vacuum cleaner for you and your space can help you take back your home’s cleanliness. A good machine is an investment, so it's essential to approach your appliance decision based on your home's unique needs. 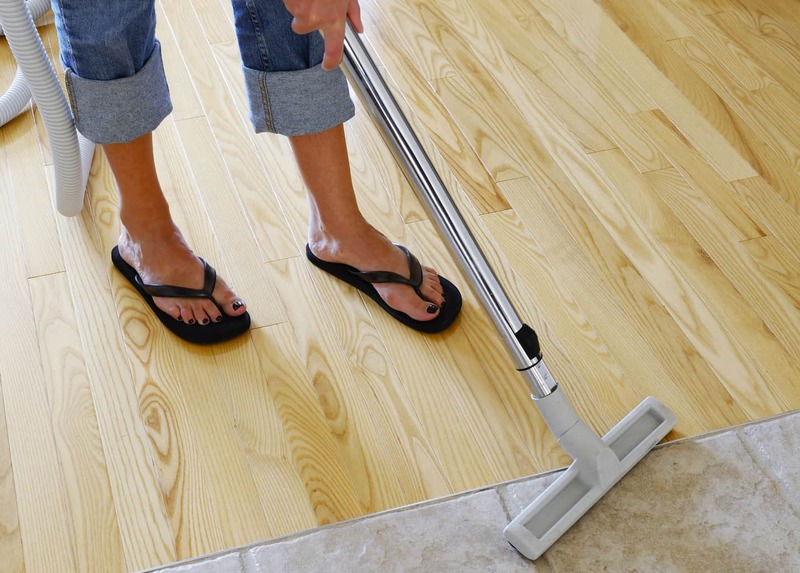 It’s a common misconception that homes with hardwood floors are restricted to mops and rags. However, this isn’t the case. A house full of tile and hardwood still needs a vacuum. But you can’t use any old vacuum; hardwood floors need a particular type of vacuum that will remove debris from the floor. Simultaneously, you want to ensure that it won't ruin your beautiful and newly finished flooring. 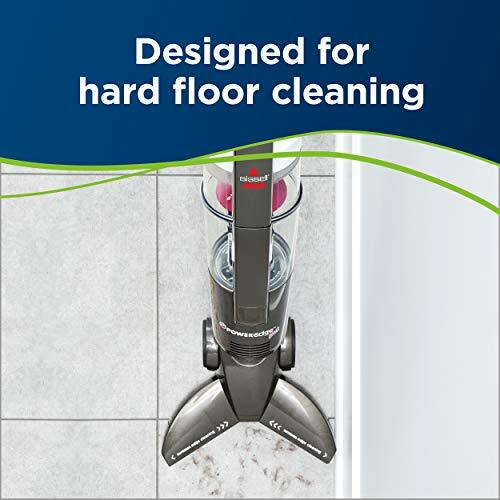 Whether you are passionate about cleaning or merely want to preserve your fantastic floors, you've come to the right place to discover your dream vacuum appliance. We tested five of the top models on the market today and put together this step-by-step guide – all in a quest to help you choose the right vacuum. If you’re determined to battle the cluttered landscape of mediocre cleaning devices once and for all, keep reading to find your choice for the best hardwood floor vacuum of 2018. 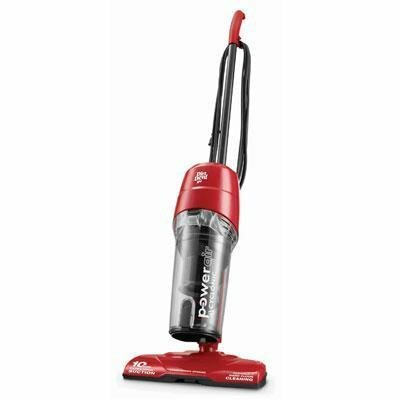 When you need a sturdy, lightweight stick vacuum for hardwood floors, put the renown Dirt Devil brand on your list for consideration. This vacuum is not only easy to use, it is also designed primarily for safe use on beautiful hardwood floors. Dirt Devil’s new Power Air is perfect for swift pickups on hardwood floors and can easily be stored in tight spaces. 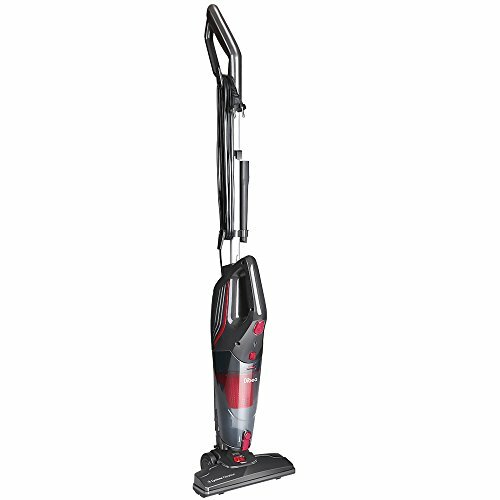 At just 6.67 lbs and with a 20 ft cord, this vacuum cleaner allows for easy maneuverability around the house. 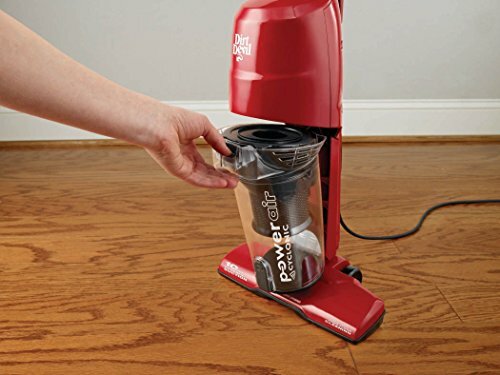 The 10 amp motor contributes to a robust bare floor clean, while an 11-inch cleaning path means that you can cover more area with fewer passes. 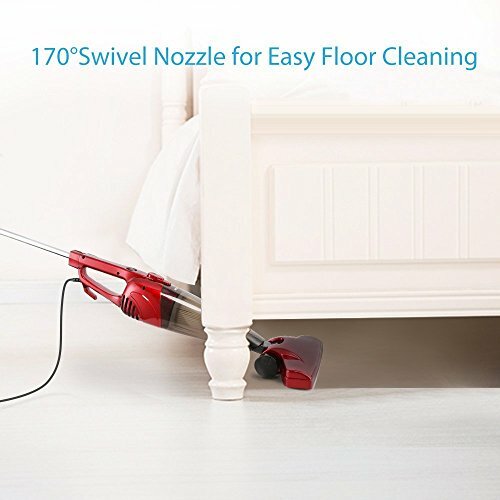 The low Profile Nozzle transforms cleaning on, around, and underneath furniture into an easy task. When you're done just dump the dirt cup in a trashcan with a simple touch of a button. 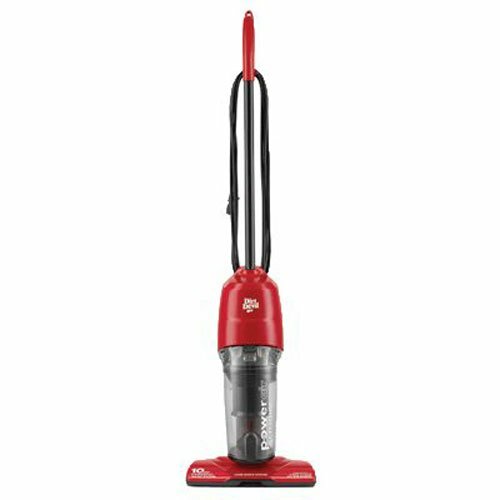 What's to like about the Dirt Devil Power Air Vacuum? For a lightweight, bare floor vacuum, I was blown away by how much power this has. It's super easy to assemble and cleans thoroughly. It's a great deal for the price and had reasonable overall results. What's not to like about the Dirt Devil Power Air Vacuum? My first thought when I put this vacuum together, was that it felt cheap. The materials just don't feel like high-quality metal or plastic. The vacuum is extremely loud and noisy, which is a bit disappointing for a vacuum in this day. It has an exhaust that blows out the front, moving around dirt before you have a chance to pick it up. While it is safe for use on hardwood floors, it does not work well on multi-surfaces or carpet. The Dibea Corded Stick Vacuum offers high-powered hard floor cleaning with 15kpa and 600w powerful suction. The long cord (19.7 ft) allows easy cleaning of multiple rooms without having to adjust the cord. It is exceptionally lightweight at 4.6 lbs. Flexible swivel steering allows for easy maneuverability around or under furniture. The Dibea Corded Stick Vacuum is designed for better clean of most floor types including hardwood, ceramic, vinyl, tile, and thin carpets. Cat litter, pet hair, food debris, and much more can be picked up quickly with its powerful suction. The no-brush roll design won't get stuck on pesky hair and other debris. Just detach the vacuuming head for easy transformation into a lightweight hand vac to tackle tight spaces and smaller messes. Enjoy the 1L large capacity dirt cup for easy disassemble and empty. 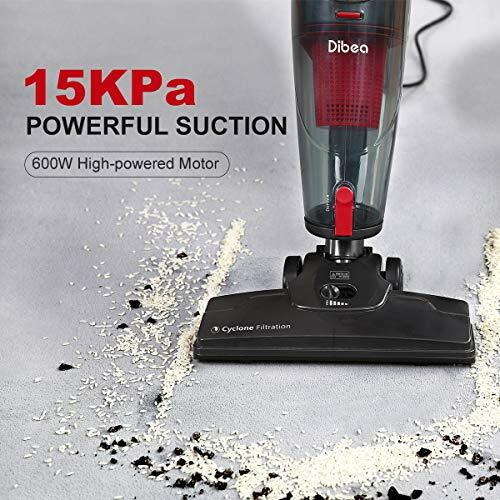 The Dibea Corded Stick Vacuum offers high-powered hard floor cleaning with 15kpa and 600w powerful suction. The long cord (19.7 ft) allows easy cleaning of multiple rooms without having to adjust the cord. It is exceptionally lightweight at 4.6 lbs. Flexible swivel steering allows for easy maneuverability around or under furniture. The Dibea Corded Stick Vacuum is designed for better clean of most floor types including hardwood, ceramic, vinyl, tile, and thin carpets. Cat litter, pet hair, food debris, and much more can be picked up quickly with its powerful suction. The no-brush roll design won't get stuck on pesky hair and other debris. Just detach the vacuuming head for easy transformation into a lightweight hand vac to tackle tight spaces and smaller messes. Enjoy the 1L large capacity dirt cup for easy disassemble and empty. What's to like about the Dibea Hardwood Vacuum Cleaner? This product is just about as lightweight as they come, with absolutely no compromise on power. It works well in homes with pets and on a variety of surfaces- plus it was completely safe on my hardwood floors. The long cord is convenient, while the smooth swivel motion can fit into tighter spaces. I love that this vacuum can stand up on its own for secure storage and that it’s lightweight enough to carry around. What's not to like about the Dibea Hardwood Vacuum Cleaner? Emptying the canister is a bit more cumbersome then described. The vacuum head and handle must be removed before you can drain the canister, then it must be reassembled. I also found this vacuum to be a bit louder than most, but it did get the job done regarding suction. When it comes to tackling hardwood floors, large and small debris are a concern. As well, extra equipment often needed for hardwood floors can be cumbersome and inconvenient. The Bissel PowerEdge Vacuum Cleaner solves these concerns in a never before seen design. Keep reading to learn more. 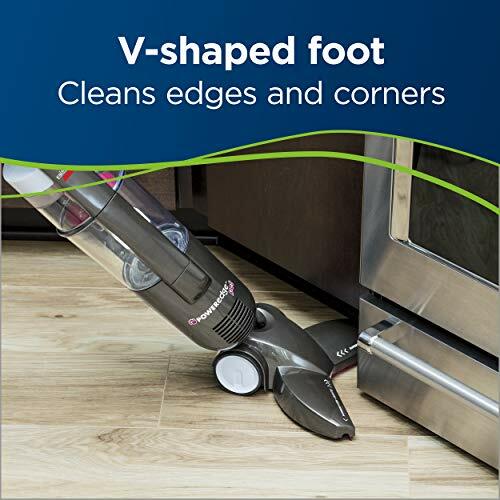 The Bissel PowerEdge Pet Hard Floor Vacuum has a unique V-shaped design, created for the better capture of both fine particles and large debris without the need for a brush roll. The V-shaped wipers force all of the debris clearly into the more significant suction path, while fine particles are suctioned along the arms. The wipers themselves are made from a rubber hair-attracting material, giving it extra power over pet hair than suction by itself. The shape, swivel head, and lightweight design also make it easy to clean around furniture legs. What's to like about Bissel PowerEdge Vacuum Cleaner? For this vacuum’s size, it has a ridiculous amount of suction. It is a preferred choice for pet hair as it pulled from corners, around chair legs, and baseboards. The absence of bristles makes this even more accessible. What's not to like about Bissel PowerEdge Vacuum Cleaner? This product does not work well on carpets or uneven floors. While I had a positive cleaning experience for the first couple of months using this product, I experienced a loss of suction over time. It is somewhat awkward to maneuver and does not readily turn as described. When you transition from carpet to hardwood floors, you need a vacuum that can handle it all. 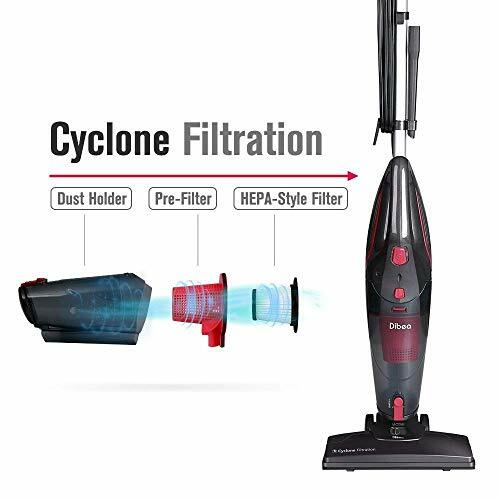 This 2-in-1 vacuum cleaner by the home staple Bestek brand ensures high-performance suction power on all of your home's surfaces, so you can rest easy knowing that you have the best clean available. Forget inconvenient vacuum bags when you enjoy Bestek’s Harwood Vacuum’s reusable and washable HEPA filter. The 16.5 ft cord allows for easy maneuverability in most rooms, while the 170-degree swivel head assists in accessing hard to reach areas. At 3.7 lbs this vacuum can easily be transported from place to place and stored with ease. 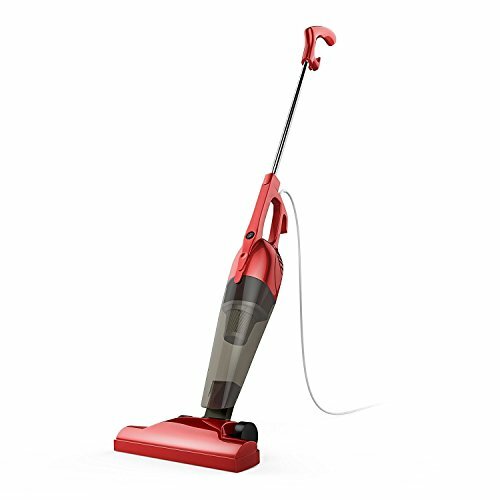 The 2-in-1 detachable vacuum design allows for comfortable furniture and stair cleaning. What's to like about the Bestek Hardwood Vacuum Cleaner? I was amazed at what this little vacuum can do. It worked pretty well both on hardwood floors and thick carpet. It's one of the most lightweight vacuums we've seen so far and is super maneuverable. For the affordable price, I felt like it was worth every penny. What's not to like about the Bestek Hardwood Vacuum Cleaner? I did wish the cord length was a bit longer. 16 feet just really isn't enough for a larger house. Although this vacuum can be used on carpet, homes with pets may benefit from something stronger for carpeted areas. The best thing about your home is the people who live in it, so it's likely that you have a lot of furniture, carpeting, and other things that make your home, well you. The Shark Rotator PowerLight Professional Vacuum Cleaner gives you ultra-maneuverability when it comes to cleaning on and around the different surfaces of your home. This lightweight, ultra-maneuverable Shark Rotator PowerLight Professional Vacuum gives you better control over the furniture in your home without ever losing suction. Featuring an ultra-quiet technology, this vacuum can be used for operation anytime, anywhere. A complete seal anti-allergen tech traps of 99% of allergens and dust inside the vacuum. It includes premium tools for versatile cleaning in the home and beyond. A deluxe motorized brush can be turned on and off for safe use on carpet and floors, while powerful headlights illuminate dark spaces. The ergonomic handle and extra capacity, bottom-empty dust makes this vacuum easy to use. A very generous 30 ft long power cord gives homeowners maximum range for cleaning large areas. This product has everything one could hope for in an at-home vacuum machine. Not only does it work great on hardwood floors, but it has roller technology you can turn on for use on carpet as well. 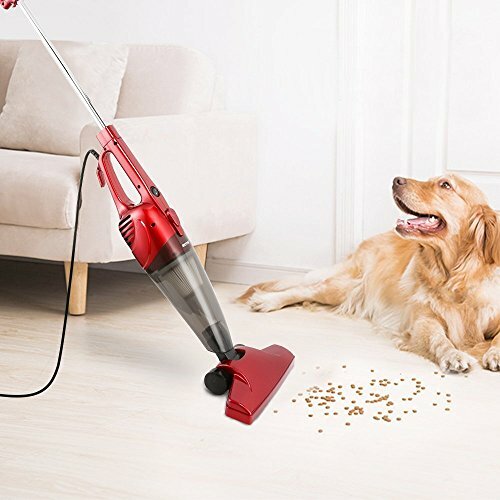 The super long cord allows for cleaning of large areas and multiple rooms Plus it’s super quiet for how powerful it is and works fantastic for homes with pets, something we find favorable compared to other vacuums. The vacuum actually feels like it was crafted from good quality materials and construction. What's not to like about the Shark Rotator PowerLight Professional Vacuum Cleaner? Although this product may be a little on the pricey side for some users, it is worth every penny. 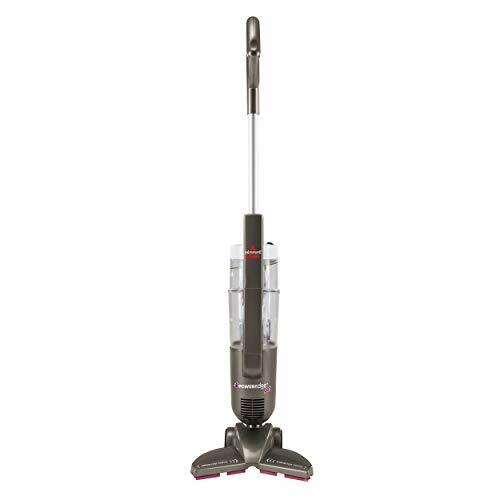 The vacuum is durable, long-lasting, and provides a superior cleaning experience. Its heavier weight can be a deterrent for some users, although this contributes to a more heavy-duty and long-lasting motor with more powerful suction capabilities. When you have the right tools at your disposal, eliminating debris and dust can be a simple job. Start by determining the best type of vacuum for the kind of surfaces and cleaning you do. If you have a lot of rugs and carpeting, uprights with a bag may do best overall. If you have a lot of tile floors, laminate, hardwood, or stairs, uprights designed for wood or canisters might be easier to maneuver. Have lighter tasks that need attention? Stick to handheld vacuums or even a robotic device for a set-it-and-go crowd. At the very least you want to find the most efficient vacuum for your cleaning type and price range. Hardwood floors add natural beauty and elegance to your home. With the right maintenance and care, it’s possible to preserve your wood’s luster and keep your panels looking as good as new for many years to come. However, many homeowners make the mistake of using an ordinary vacuum. The problem is that even top-rated vacuums can cause damage to your beautiful wood floors if they are designed with carpeting in mind. Plastic wheels and roller brushes can easily scratch wood surfaces and scatter debris, making it even more difficult to get an efficient clean. If you want to find a vacuum for your hardwood floors that make your life easier, keep an eye out for these essential hardwood vacuum features. Vacuum rolling brushes are designed to extract debris, hair, dirt, and lint that hide inside carpets. Since homeowners with hardwood floors don't have to deal with this issue, the brush can do more harm than good by scratching your surfaces every time you use it. Look for models that don't have a rolling brush or have options to keep it from spinning while you use it. Extra rubber padding and wheels help prevent dings, scratches, and other damages caused by plastic wheels on hardwood surfaces. Giving yourself and your floors an extra cushion helps create a better and more flawless hardwood cleaning experience. No one enjoys the idea of having to lug a heavy appliance around. In this day in age, you don’t have to. Lightweight models have become a new standard in cleaning appliances. Stay wary of machines that appear clunky and hard to use, as their equipment is probably not up to date either. Other than protecting your floors, a vacuum’s most crucial job is suction. The very best vacuums have superior power and suction quality to ensure that no debris, dirt, or dust is left behind. Vacuum cleaners are available in three basic types: stick vacuum cleaners, canister vacuum cleaners, and upright vacuum cleaners. Stick vacuum cleaners are the most common type of vacuum cleaner available today. They have a powerhead, tall bodies, and handles. They can be battery powered or corded. Typically, they are the most lightweight and convenient. Canister vacuum cleaners are great for cleaning upholstery, drapes, under furniture, stairs, and bare floors. They are quiet but clunky and hard to store in a closet. Upright vacuum cleaners tend to cost less than a canister, offering a broader cleaning swath. They are generally designed for deep cleaning carpets. 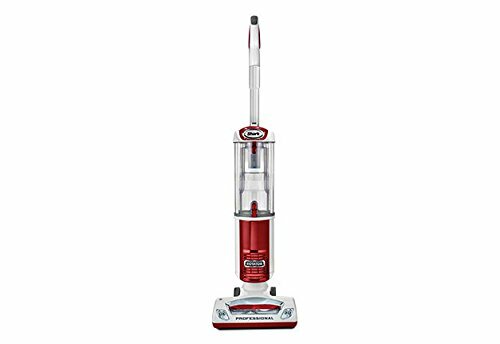 Can all vacuums be used on any surface? Unless you have a vacuum designed for both carpet and hardwood floors, you aren't going to experience the same results on different surfaces. In fact, using the incorrect type of vacuum for your floor type can lead to more damage than good, along with a loss of cleaning ability. Is an upright, canister, or stick model better for my hardwood floors? There is a lot of debate on whether an upright, canister or stick vacuum is better when it comes to hardwood floors. While they each have their pros and cons, it comes down to personal preference. Uprights are heavier and difficult to move while canisters are easily portable. Stick models are lightweight and easy to maneuver. If you have a two-level home, a canister model or stick option is your best option. Is there a difference between bagged vs. bagless cleaning? Bagged versus bagless vacuums offer no difference in cleaning ability. The preference typically comes down to convenience. Bags are less messy but require replacements on hand. Bagless vacuums are more convenient but can irritate someone in your home who has allergies. What do hardwood vacuum cleaners have that others don’t? Hardwood vacuum cleaners are designed to protect the beauty of your floors. This means that they should replace harmful rollers that can scratch your wood surface with more powerful suction and soft rubber wheels, or at least have the ability to turn the rollers on and off. When you need a vacuum that’s going to get the job done right, you simply cannot go wrong with the Shark Rotator PowerLight Professional Vacuum Cleaner. This product is not only designed for safe use on hardwood floors, but it works great on carpet too. How can it do this? – You might be wondering. Well, it has roller technology that can be turned on and off depending on the surface you are cleaning. This is not only convenient, but it provides a superior cleaning experience. The Shark Rotator’s features don’t stop there. It features ultra-swivel technology, a super long 30-foot cord, and even headlights for those hard to reach places. At 17.5 pounds, the product is more substantial than most, but still light enough to move around the house with ease. Plus, with "never loses suction" technology, you don't have to worry about this vacuum failing in the next months to years. While this product is on the higher end of the cost spectrum, it is worth every penny for its long-lasting use. When you need a powerful vacuum for hardwood, carpets, and homes with pets, you simply cannot go wrong with the Shark Rotator PowerLight Professional Vacuum Cleaner. I usually vacuum the whole house once a week…and mop. I’ve made it a chore for my oldest son, though, to run through the hall and living room every evening. It doesn’t always get done, but we’re workin’ on it. :) Our living room can get pretty messy if we don’t, just due to it being the most “lived in” room in our house, besides our kitchen.